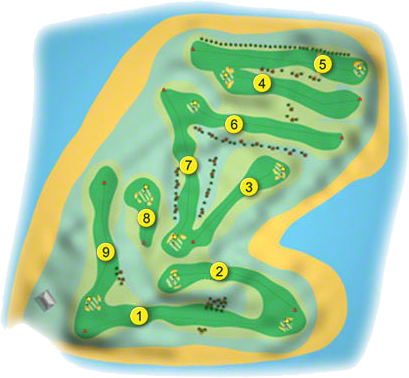 Mahee Island Golf Club is a 9-hole Parkland course set on an Island in existence since 1929 and designed by a Mr. Robinson it measures 5,822 yards with a Par 71 and a SSS 70 off the men's tees. The ladies course is not much shorter at 5,564 yards and a Par 72 SSS 71. Mahee has no bar but meals can be arranged if booked in advance. Mahee Island Golf Club won the All-Ireland, Jimmy Bruen Shield at Malone Golf Club in 1991, when the team was, Mervyn Marshall, Robin Mitchell, C. Wilson, R. Dodds, Tom Reid, Lee Robinson, Jackie Bennett, Robert Jellie, William Stewart, Trevor Totten, David Lindsay and Jim Moreland, they were captained by Graham Savage. Mahee Island Golf Club won the Ulster Final of Jimmy Bruen Shield in 1988, when the team was, William Stewart, Geoffrey Stevenson, Lee Robinson, M. Moreland, W. Mayne, Mervyn Marshall, S. Glover, William McClement, Tom Reid, Robin Mitchell, Billy Gibson, Robert Jellie and Graham Savage, they were captained by David Lindsay. In the North Down area during the 1920’s golf could be described as an expanding sport. Although, still considered mainly a recreation for the gentry, it was nevertheless becoming more accessible to the middle classes. 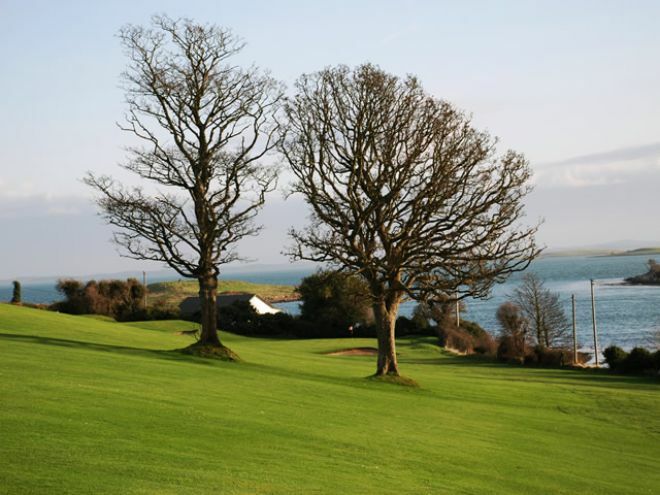 It is interesting that during a short period of some 3 years, firstly Carnalea then Mahee Island, followed by Clandeboye, should decide to construct golf courses. Around this time Mr. Stanley Cather, a Belfast businessman built a “week-end” cottage on Mahee Island. Little is known about Mr. Cather as a golfer who, although a member of Ormeau Golf Club, apparently “played little” and was judged to be” of poor ability”. He did, however, realize the potential of the land on the Island being turned into a golf course. This is perhaps not difficult to understand, since Mr. Alex Johnston, landowner, had for some time grazed sheep on the land, the closely cropped grass could have reminded Mr. Cather of the links fairways he had seen on other courses. Many clubs at that time grazed sheep to assist the work of the Greenkeeper. Stanley Cather is rightly credited with the inspiration but it was fortunate that Mr. David Boyd who lived on the Island was a keen sportsman. David Boyd loved sailing and was a keen motorcycle-racing enthusiast but had never played golf, so one can only imagine how Stanley Cather convinced him and indeed the landowner Mr. Alex Johnston, that golf was a possibility. Mr. Johnston became so enthusiastic for the game and for the new Club, that his generosity knew no bounds. He lent the Club his machinery and his workmen; he involved his family and” let” the land at a ridiculously low rent, a little under £1 an acre. Alex Johnston, Stanley Cather, Hugh, John and David Boyd provided all the early momentum needed to establish the Mahee Island Golf Club. Golf was certainly played on Mahee Island in 1929, although the first recorded General Meeting took place in the Andrews Memorial Hall in Comber on Friday 11th April 1930. At that meeting Mr. David Boyd (Hon Secretary) delivered a report of the events of 1929. This report showed that “Mr. Robinson from Bangor was engaged as Course Designer and work began under his supervision on the last week of March. The course was opened for play on 26th June 1929.” Obviously, beautifully manicured courses were not the order of those by-gone days. The report continues, “Two new greens were made, the balance of the greens being left without much work pending the winter season coming on". Mr. Hugh Boyd (brother of David) was President of the Belfast Rotary Club and at his invitation 60 members of the Rotary played the course in July of that year, bringing much needed financial help in green fees. The visitors were impressed, the secretary’s report shows “Those taking part in the Competition while admitting that the course was exceptional for the time spent making it available for play, considered that future work would make the course a nice sporting one.” During that first year no great effort was made to attract members, but to generate necessary finance a “Bond Scheme” was introduced. For £50 a Bondholder and his family could play free of charge, until the bond was redeemed. In the late 1920’s £50 was a considerable amount but still seven gentlemen took up the option, Stanley Cather, James Thompson, George Clark (later Sir George), John Boyd, Hugh Boyd, David Boyd and Dr J C Johnston. When it was discovered that the horse could not pull the Gang Mowers, a tractor was purchased for £95, this was paid for by John and David Boyd until two additional Bond Holders could be found. Records show that only one further Bond was purchased, by Major C Blakiston- Houston who died in the early 1930’s at which time the Bond passed on to his wife. Thanks to the generosity of these gentlemen, the first year in the Mahee Island golfing story passed successfully, even showing a financial balance of 6 Shillings and one penny. William Rennick Robinson, the Course designer, was a businessman in the Linen Industry. He had a very keen interest in golf and greatly influenced the game in the North Down area. He designed the first 9-hole course at Bangor Golf Club in 1903 and was actively involved in the Club for many years. He was also a highly respected member of Royal Belfast serving on the Council there from 1922 until 1926. The Bangor Urban Council after purchasing the Clubhouse and Course from Royal Belfast, engaged Mr. Robinson to design and construct a new 18 hole Course on the site, to be called Carnalea Golf Club. His work on that project received high praise and was completed in just 4 months. In 1929 he designed the layout and supervised the work of John and Hugh Gabbey as they constructed the Course at Mahee Island, completed in 3 months. He then moved on to design the original Course at Clandeboye which was opened for play in 1930. He became very heavily involved with the new Clandeboye Club eventually becoming President, a position he held from 1945 until 1947. William Robinson was a fine “scratch” golfer and is recorded as partnering the famous Harry Vardon in a match against Alex Herd and John Hamill played at Bangor in 1927. It is interesting to know that through William Robinson these four neighbouring Golf Clubs have something in common. Besides being a very busy man he was also generous, for his work at Mahee Island he charged £20,which was the cost of his petrol to and from the course. For his efforts he is recorded as the first honorary life member of the Golf Club.